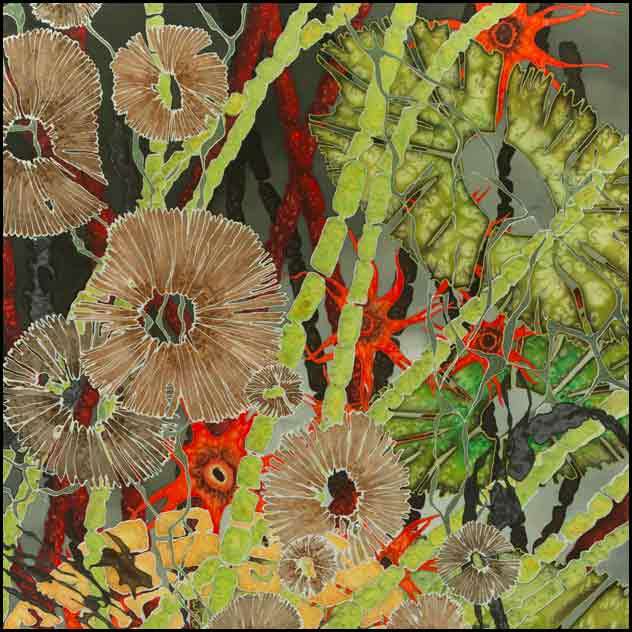 Clover paints large, bold, and brilliant images on silk that delight and fascinate. Her work blends the biological and the technological with an elegance that is both seductive and healing. Clover is a silk painter, multimedia, and installation artist. She studied at Columbia College in Chicago and now lives in Hawaii and creates in her jungle studio on Maui. Her art is in the permanent collection of the Hawaii State Museum of Art and can also be seen in various other public spaces. She has exhibited in Chicago, Denver, Japan, China, Black Rock City, Honolulu, and Maui. Kapa, known as tapa elsewhere in Polynesia, is an ancient Hawaiian art form. Traditional uses of kapa in Hawaiian culture included clothing, blankets, and ceremonial procedures. Currently there is a revival of kapa in Hawaiʻi and is often used for decorative purposes. Kapa is made from the bast of the wauke plant. Wauke is a type of mulberry that was introduced when Polynesians first settled in Hawaiʻi. Kapa making includes several stages from growing the plants, preparing the bark, pounding the fibers, to coloring the pieces with natural dyes. Denby’s extraordinary kapa art is produced using the traditional Hawaiian making methods. She completes all the stages herself. Originally from Oahu, Chenta Laury is a Maui-based artist who has lived and studied visual art in the Midwest and on both coasts. She has exhibited in solo and group shows in New York, Boston, Sacramento and Honolulu, and her work is held in numerous private collections. She has an undergraduate degree in studio art and art history from Oberlin College, a Masters from Harvard University, and a Certificate in Applied Arts from the Fiber Crafts Studio in Chestnut Ridge, NY. Self-taught fiber artist Mika McCann has explored the art of fiber since she was child. Born and raised in Tokyo, Japan, Mika mastered in formal Japanese flower arrangement, a tradition she carries into her unique fiber art. Her artwork, which she strives to keep simple, ranges from five to six foot sculptural pieces to miniatures only a few inches high. No two pieces are alike. Choosing only unaltered, locally-found materials, Mika works without the aid of dyes to present natural earth-bound works of art. You will find Mika's work displayed both nationally and internationally in galleries, six art museum permanent collections world-wide, first-class hotels and private homs. The Hamburg Art Museum in Germany is one of the museum collectors of Mika's work. The American Craft Musem in New York had included Mika's work for many years. The ancient wisdom of Hawaii, expressed in Batik fine art. Sarai is currently creating in both of her beautiful Hana and Waihe'e art studio's on Maui. Knowing that her calling was to be an artist and live a life true to the philosophy of Aloha Aina, "to love the land", Sarai has apprenticed with many of Hawaii’s kupuna (elders), keepers of the wisdom. She has traveled and lived on several islands where she gathered a deep understanding of island mythology, story lines, and founding energies. Her close association with her teachers has led to a particular intuitive understanding of form, color, and knowledge of what is appropriate for the occasion. Through the painstaking processing, she understands the making of batik in the old manner which is very labor intensive.